SPRINGFIELD — Thousands of teachers, social service providers and government workers surrounded the Illinois Statehouse Wednesday, calling on lawmakers to fix the out-of-whack state budget. So is all this rallying really going to push lawmakers to raise our taxes? The short answer is: Probably not. “To say that is going to rally enough support for a tax increase, I don’t think so,” said state Rep. Dan Brady, R-Bloomington. But that didn’t certainly stop them from coming. After the rally, many of the people participating in the rally visited one-on-one with their local lawmakers. We’ll see if that convinced any leery lawmakers to vote for a controversial tax increase in an election year. But if I were a betting man…well, you can see where I’m going with this. 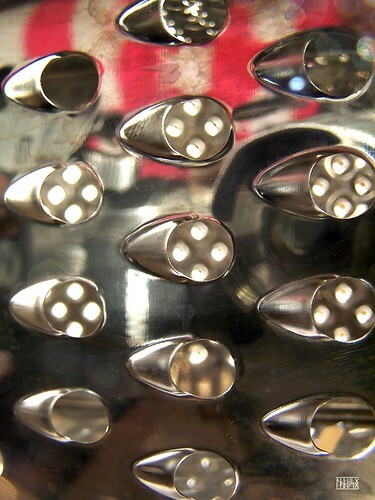 State makes an emergency purchase of…bullets? SPRINGFIELD-The volume of Illinois’ unpaid bills will likely increase by $1 billion in the next three months, according to a new report. By the end of June, the backlog of unpaid bills could exceed $5.5 billion “absent any other developments,” noted Comptroller Dan Hynes, in a quarterly report on the state’s finances. Now, the state’s 200,000 unpaid bills total $4.5 billion. Meanwhile, the comptroller’s report is not putting much faith in the ability of lawmakers to correct the problem before they adjourn in May. SPRINGFIELD — The Illinois Department of Corrections was forced to make an emergency purchase of ammunition last month because of the state’s inability to pay its bills. The purchase happened after one of the state’s ammunition vendors, Shore Galleries Inc., refused to ship bullets unless the company was paid up front. The state owes the Lincolnwood firm $6,000. The department was able to quickly find a new vendor in Indiana and ordered 761,000 rounds for nearly $200,000. I have seen examples of vendors getting upset at the state because they are waiting months to be paid. But an ammunition vendor refusing to sell bullets to the state? That’s scare stuff. “This is just another example of the state’s broken budget coming home to roost,” said [Anders Lindall, spokesman for the American Federation of State, County and Municipal Employees union]. Stay tuned for bizarre happenings in the Capitol. Image posted by Flickr user DeusXFlorida. It is used under a Creative Commons license. The graphs were easy to make using Google Documents. Google literally has an answer for anything. The issue of lottery privatization will probably remain a hot story for the next few years because it is a very long and drawn out process. And, obviously, the state could choose not to privatize it. So it will be interesting to see where Illinois, and other governments, goes from here. Regardless, I would expect to hear more about privatization in the coming months and years as more entities face the harsh realities of an economic downturn. 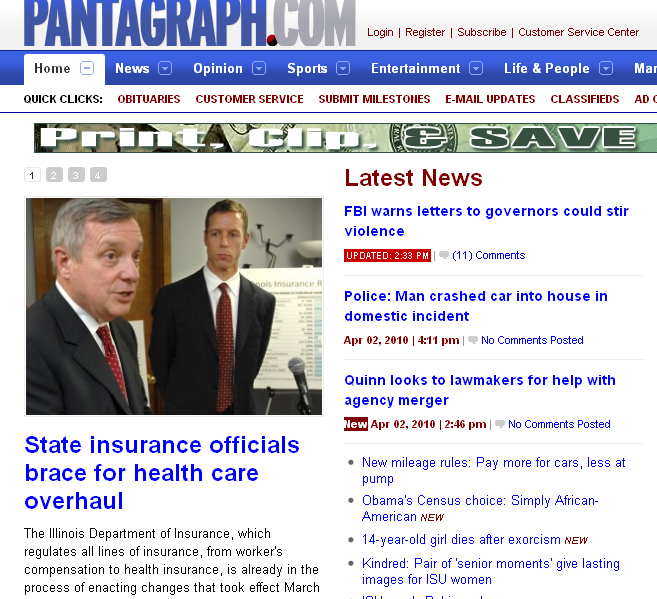 It’s not too often I get a story posted on the front page of any of our newspapers’ web sites. More often that’s because we don’t have compelling art (or any art, for that matter) to go with the story. Fortunately, a story I worked on today on the Dept. of Insurance had file art and it ran on the front page. SPRINGFIELD — Michael McRaith knows he has a lot of work ahead of him. As director of the Illinois Department of Insurance, his agency is responsible for implementing many of the key initiatives in the recently approved national health care reform legislation. Some of the changes took effect immediately, but others will take years to carry out. Either way, much of implementation will fall on the shoulders of the state. I tried to make this feature-y, obviously. I thought maybe that would make it different than the bazillion other articles on health care reform. I think it worked.